The Constant Z is used when creating motion keyframes. The Z function will use stop-motion keyframes and will not be interpolated, this can be very useful for cut-out animation. The Constant Z feature only works with 3Dpaths. 1. In the Timeline view, expand the function of the layer you want to set to Constant Z. 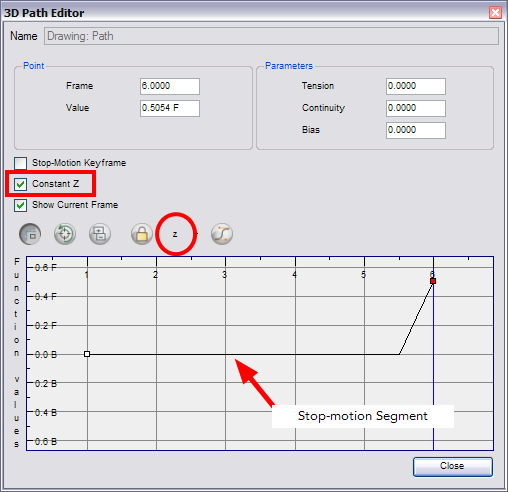 Note that the 3D Path option must be enabled for that particular layer. 2. Double-click on the Position function to open the Function Editor. 3. In the Function Editor window, select the Constant Z option.